Appearance: This pours a gorgeous, cloudy orange light bulb of a beer. The beautiful amber haze resembles an IPA from the land of New England or a full-bodied Tired Hands brew. Bubble arcs streak across the sides of the glass like a beer EKG and the surface is coated in a white sheet of foam as thick as Grandma’s winter duvet. It eventually settles to a clear oil slick and patchy clusters of white islands. Gorgeous looking beer that makes me appreciate the snifter pour rather than the more appropriate fluted glass. Aroma: A sniff finds acidic sour apple, mineral/iron, burnt toast and barnyard funk that is just impressive. A touch of sulfur lingers in the background, like someone threw a lit match through the room five minutes ago. The levels don’t get near horse blanket and for that, I am grateful. It does verge into dank hay bale, but mixes with the other Lambic qualities to hit a high note of barnyard aromas. I never thought I’d be as into an aroma with this much funk up in it, but damn is this fine. 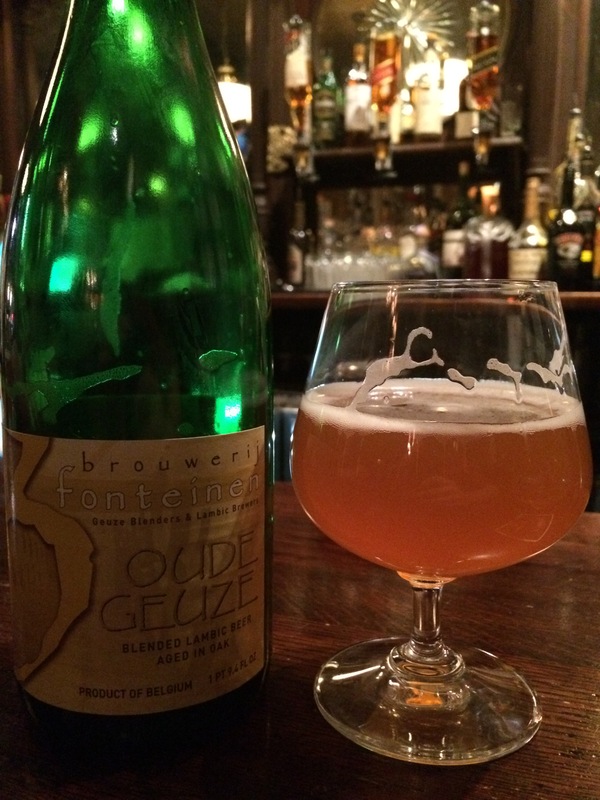 Taste/Mouth Feel: I eye up the deep, coppery tangerine depths of this Gueuze and take a sip. The mouth feel is soft with small-bubbled carbonation. The body is substantial for such a low ABV and maintains a drinkability that is slightly dangerous. The danger comes from drinking this beer too fast and not taking the proper time that it deserves. The overall taste is a swelling bell curve of green apples and acidic sour/salty lemon that peaks and pleasantly subsides as it rides a bready grain wave down to a dry finish. A mild sour tang does pleasantly linger on the tongue, making me want take delectable sip after delectable sip. A bit of barnyard funk and a perfect touch of sulfur just at the flavor crest makes this a Gueuze that has it all. Note: As you drink it, the bottom of the bottle gets a bit drier and the acid can catch the back of the throat. Definitely has a bite that doesn’t back off. Final Thoughts: I’ve never had a beer that marries an aroma and taste so perfectly like Drei Fonteinen’s Oude Gueuze. Exactly what you smell is exactly what you taste. Amazing follow through creates a near perfect sour/barnyard Geuze that goes to the precipice of excess and lets your taste buds dance along the cliff edge. Other Lambics wish they could be this good and this is easily my favorite Gueuze. Worth the cost and I wish I bought a few more bottles to sling some age on it. My current sour benchmark and the absolute pinnacle of sours for me, even over Cantillon. Recommendation: You see it, buy it.